Thanks in part to the legacies of presidents like Ronald Reagan and the Bushes, our country may have been long overdue for an expansion of the social safety net. But Europe shows us that, on the whole, social programs reduce employment, not raise it. Progressives point out that the Western European economy has a lot going for it: a productive work force, new technologies, universal health care and access to education. Perhaps they’re right that getting our government more involved in the economy and smoothing out capitalism’s “rough edges” would give Americans some of those things, too. Those same progressives tell us that expanding unemployment insurance and other government programs is an easy way to raise employment in the United States. But they seem to have forgotten that European policies have probably caused Europe’s employment to be less than ours, not more. The chart below shows the percentage of people who are employed in the United States and in the six Western European countries for which the Bureau of Labor Statistics has compiled comparable employment measures. Employment has been consistently lower in Western Europe, with an average employment rate gap of 10 percentage points over the years 1980-2007. 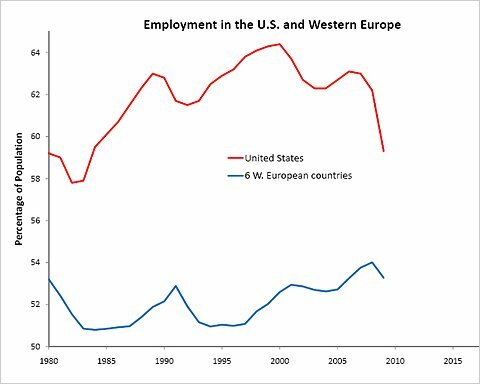 Our recent sharp drop still leaves two-thirds of the European-American employment gap that was there a few years ago. Economists have debated the reasons for Western Europe’s relatively low employment, although they generally agree that public policies are at least part of the story. Profs. Edward Prescott, Jonathan Gruber and David Wise have argued that taxes of one kind or another give Europeans less reason to work. Profs. Alberto Alesina and my fellow blogger Edward L. Glaeser blame more of the difference on heavy regulation of the European labor market. Demographics, especially immigration, are also part of the story, although government policies are responsible for part of the demographic differences, too. I do not expect our government policies to become 100 percent European any time soon, and even if they did, some employment gap might remain. If the employment rate gap is ultimately only 2 percentage points less than it was before the recession (8 percentage points rather than 10), that will leave our employment pretty similar to what it is now. Our future is likely to have a permanently larger role for government, and that means employment rates may never be as high as they once were. We might enjoy some of the European lifestyle, or recover the jobs lost during this recession, but not both. Case-Shiller reported today that housing values in July 2011 were higher than they were during the entire life of the "Home Buyer Tax Credit". Yet the conventional wisdom, not to mention Professor Shiller's own analysis, says that the home buyer credit was the only thing propping up the housing market. The Home Buyer Tax Credit contained in the American Recovery and Reinvestment Act of 2009 has been given much credit for buoying the housing market. But recent housing market data suggest that the credit’s effect was limited, even while it lasted. The law passed in February 2009 included a temporary 10 percent capped tax credit for qualified first-time home buyers that expired April 30, 2010. The program was later expanded to include repeat home buyers, and recently home buyers were given until September 2010 to complete qualified transactions. One view of the tax credit’s effect is that it changes the timing of housing transactions — market participants rush to complete transactions before the credit expires — but has little effect on the value and quantity of homes because homes are expected to last many times longer than the tax credit does. Another view is that the market cannot do without the credit, and the housing market collapse that preceded it may well continue when it’s gone. Although we do not yet have housing data beyond the summer of 2010, homes take time to build and housing starts can be informative about what will happen in the housing market over the next few months. A housing start is likely to be a house that will be finished in a few months, and presumably builders expect to command a high enough sales price to cover the costs on building the house. 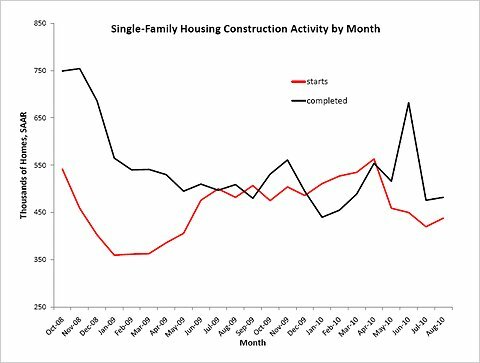 The chart below shows seasonally adjusted single-family housing starts and completions since October 2008. Housing completions rose sharply as the deadline neared and spiked immediately after it, and for July and August were about as low as they have been in years. Housing starts began coming down this spring, which helped set up the situation of few completions in July and August. But yesterday’s release by the Census Bureau confirmed that housing starts are not much lower than they were in the second half of 2009, when the tax credit was supposedly propping them up. For now, it appears that, aside from this spring’s rush to meet the tax-credit deadline, the housing market after the tax credit will proceed at much the same pace it did for the time that the credit was in place. Did the Census Stimulate the Private Sector? According to Keynesian economists, government hiring stimulates the private sector during a recession because government employees go out and spend much of their paychecks in the private sector, and extra demand is exactly what the private sector needs during a recession. But this year’s experience with census hiring contradicts that view. Keynesians acknowledge that, someday, the private sector will pay taxes to finance the salaries and benefits of government employees, but this cost is said to be offset by the additional demand for goods and services produced in the private sector, which have those government employees as their customers. Obama administration economists used this logic in January 2009 when they persuaded Congress to pass the American Recovery and Reinvestment Act, assuming a “multiplier”: that every 10 people hired under the law would create an additional six jobs. This is why they thought the law would have pushed the unemployment rate down close to 7 percent by now. Of course, the unemployment rate is still close 10 percent. This might show that the legislation failed to stimulate the economy, or that the economy was in worse shape than the Obama administration originally thought, or both. The Obama administration now says that employment would have fallen seven million if it weren’t for the stimulus, rather than the drop of four million that actually occurred from early 2009 to early 2010. I don’t blame the Obama administration for underestimating the depth of the recession. But so far it has no way to derive its seven million estimate except by assuming that it had been right all along about the potency of the stimulus. The law was admittedly a reaction to the state of the economy, but the 2010 census is a result of Article I of the United States Constitution, and thus provides an opportunity to measure effects of government hiring that might not be confounded by contemporaneous economic events. The solid blue line in the chart below displays total payroll employment, inclusive of census workers and other government employees. 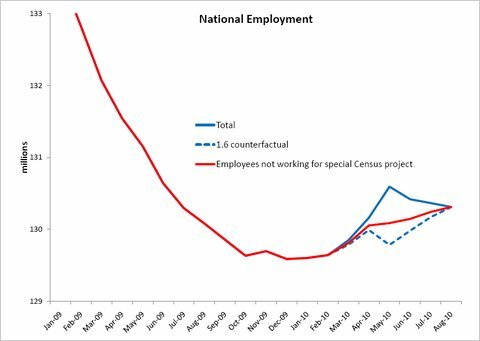 The red line is employment apart from special census employment (I estimate special census employment as the difference between total federal nonpostal employment from its relatively constant amount outside the months February-July 2010). If there were no extraordinary employment events this spring aside from the census, and, as Keynesians contend, hiring special census workers created jobs apart from the census, then the red line should have spiked like the blue one. In fact, the spike in the red line, if any, is pretty subtle. If every 10 people hired for the census created an additional six jobs, then the only way to explain what actually happened is to contend, as shown in the dashed-blue line, that May and June had extraordinary and negative employment events that were offsetting the private sector benefits of census hiring and thereby obscuring an otherwise obvious spike in the red line. Perhaps the stimulus benefits of public employment are both large and too subtle to be easily seen in the aggregate employment data or the private sector’s appreciation of public employment programs has been frustrated yet again by extraordinary negative events that miraculously coincide with true stimulus. Or maybe the Keynesian multiplier has been exaggerated. During the recession of 2008-9, the federal government took a number of steps to help citizens and the economy, including expansion of food stamps and unemployment insurance, helping financially distressed homeowners refinance their mortgages, and offering tax credits to poor and middle class persons buying homes. The stimulus potential from these and other programs is said to derive from their redistribution of resources to persons with a high propensity to spend, but the same programs also implicitly raise marginal income tax rates because eligibility for them falls with the potential recipient’s income. High marginal income tax rates by themselves “normally” reduce economic activity to some degree, rather than increase it, although there is plenty of room to debate the magnitude of incentive effects. For the same reason, social safety net programs are not expected to increase employment in the long run. 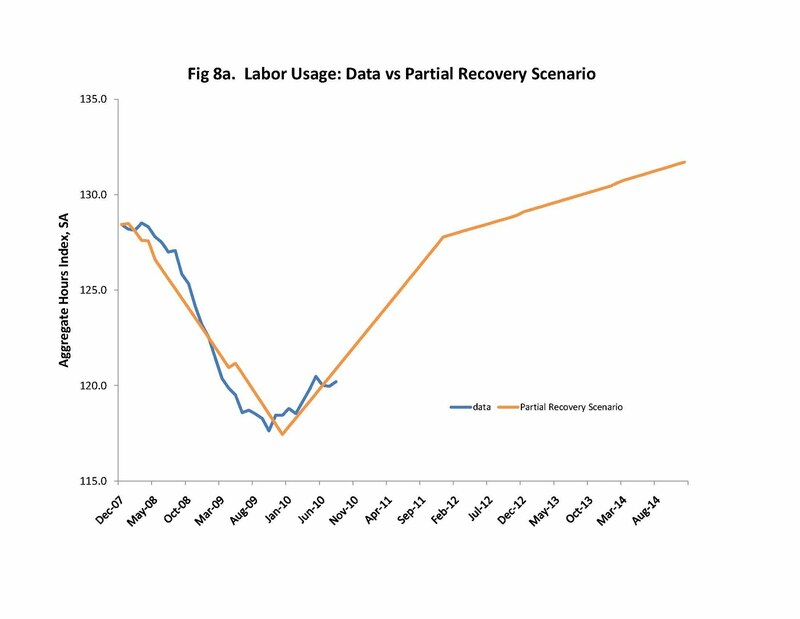 But a number of economists believe that recessions are those rare instances when labor supply does not matter, and might even affect the aggregates in the opposite direction as usual (Eggertsson, 2010a). Thus, it is possible that government spending programs like unemployment insurance could stimulate economic activity during a recession, even while they eroded labor supply incentives, and even while those programs had very different effects in non-recession years. The hypothesis that, as compared to non-recession years, demand matters more and supply matters less for determining aggregate employment and output at the margin in a recession is also the intellectual basis for Keynesian models of the business cycle (Eggertsson, 2010b, p. 2). 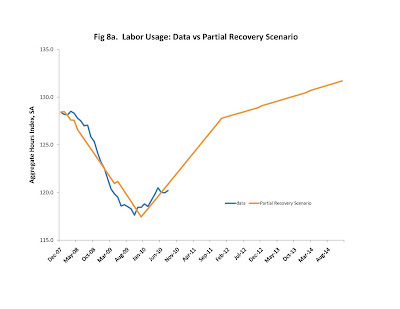 Yet this hypothesis has not been the subject of much empirical testing, even though it is logically possible that supply matters at the margin just as much during times of severe labor market distortions as it does “normally.” The purpose of this paper is to examine the seasonals in the monthly U.S. data dating back to the 1940s to attempt to measure the degree to which labor supply and demand differentially affect employment and unemployment during recession periods than during non-recession periods. The seasonal cycle has several analytical advantages. As Jeffrey Miron (1996, p. 17) explains, “The seasonal fluctuations are so large and regular that the timing of the peak or trough for any year is rarely affected by the phase of the business cycle in which that year happens to fall.” For example, Barksy and Miron (1989, Table 2) found that GNP falls 8 percent more than normal from Q4 to Q1. In a $14 trillion/year ($3.5 trillion/quarter) economy: that’s a sudden reduction of $280 billion, which is a larger change than even the largest year-to-year change in government spending created by the American Recovery and Reinvestment Act of 2009 (Congressional Budget Office, 2009, Table 2), and larger than other peacetime government spending shocks (Alesina and Ardagna, 2009; Auerbach and Gorodnichenko, 2010; Barro and Redlick, 2009). Many economic fluctuations are not easily partitioned into “demand” or “supply,” but the seasonal cycle features an obvious demand change – Christmas – and an obvious supply change – the availability of teenagers for work during the summer. Moreover, these two seasonal impulses (measured as percentage changes from the previous and subsequent seasons – more on this below) react little to the business cycle, and thus provide the opportunity to measure different effects between recessions and non-recessions of a similar impulse. Finally, the seasonal cycles have occurred many times: there have been 12 summers and 12 Christmas’ during U.S. recessions since 1948. Even during the present recession – arguably different from many of the previous ones – Christmas and summer each occurred at least twice (depending on when the recession is deemed to have ended). Previous work on the seasonal cycle has featured quarterly data, which had the advantage that the Bureau of Economic Analysis used to report seasonally unadjusted quarterly national accounts. However, unlike the labor market series used in this paper for which the raw data are seasonally unadjusted, much of the national accounts are built from seasonally adjusted inputs, and seasonally “unadjusted” national account series were obtained by attempting to remove the seasonally adjustments that had been implicitly introduced via the ingredients. More important, the supply and demand shifts of interest here do not coincide exactly with calendar quarters. The seasonal labor supply surge is seen already in June, which is part of the second quarter, and concludes in September, which is at the end of the third quarter. Obviously, Christmas is in December, and some of its activity spills into November, both of which are part of the fourth quarter, but the monthly data permit me to use October as a benchmark for Christmas, rather than the third quarter which would differ from the fourth not only in terms of Christmas demand but also in terms of summer labor supply. Section I of this paper takes for granted that recessions are appropriately characterized as times of severe labor market malfunctions, and briefly shows that a couple of familiar theories predict that labor demand matters significantly more at the margin, and labor supply matters significantly less, during recessions than during non-recession years. However, other theories of labor market distortions predict that the incidence of supply and demand shifts would be no different during recessions than they would be during non-recessions, so these incidence questions must ultimately be answered with empirical evidence. I find that the summer seasonals for teen employment, teen unemployment and total employment are large and in the direction to be expected if labor supply had shifted significantly more than labor demand. However, the seasonal cycles for recessions and non-recessions are not significantly different from each other. The Christmas seasonals seem to be essentially the same in recession years as in non-recession years. Even the 2008 and 2009 summers and Christmas’ looked a lot like summers and Christmas’ in nonrecession years. These findings contradict the view – which is the basis for much fiscal policy and business cycle analysis – that labor supply shifts have little (or even perverse) effects on aggregate employment during a recession, and contradict the view that demand shifts encounter significantly fewer supply constraints during a recession than they normally would. Admittedly, recessions are times when the labor market does not function well, but nonetheless labor supply and demand seem to operate on the margin during recessions in much the same way that they do during non-recession years. The Christmas cycle is at least as large as the high frequency peacetime government spending changes that have been observed in U.S. history, so my results might imply that fiscal demand shocks would have much the same employment effects in a recession as they would in non-recession years. Of course, the seasonal results by themselves do not rule out the possibility that a fiscal demand increase significantly increases employment regardless of whether or not it were a recession (although see Alesina and Ardagna, 2009 and Barro and Redlick, 2009, on this point). It is possible that the labor market has different mechanisms to adapt to various supply and demand shifts, and that certain types of fiscal policy might be different from Christmas in this regard. The seasonal cycle is also easily anticipated. Either case raises the question of how, exactly, fiscal policy might be different from Christmas, why government spending might encounter fewer supply constraints than Christmas does, and how that information can be used to better design fiscal policy during recessions. Elderly people are less able or willing to work than middle aged persons. When a large chunk of Japan's population changed from middle aged to elderly, Japan had less labor supply and ultimately less output. Professor Krugman explains how labor supply was the major factor in Japan's stagnation, although admittedly not the only one. Interestingly, when it comes to Japan, Professor Krugman agrees with me that labor supply matters in the usual way, even when the economy is in a liquidity trap. But he says the opposite for the United States. Stimulus advocates have offered the United States engagement in World War II as evidence that government spending can end a depression and expand an anemic private sector. They are incorrect about World War II and give dangerous advice for today. The Great Depression began in 1929 and lasted too long. Stimulus advocates tell us that the government spending surge that occurred as a result of our joining the war is the primary reason the Great Depression eventually ended. The chart below shows the civilian unemployment rate from 1929 through 1941. With the exception of the last 24 days of 1941, the United States was not at war during those years, and its real government purchases were less than a third of what they would be during the war. Yet the unemployment rate had already come down sharply by the end of this period. 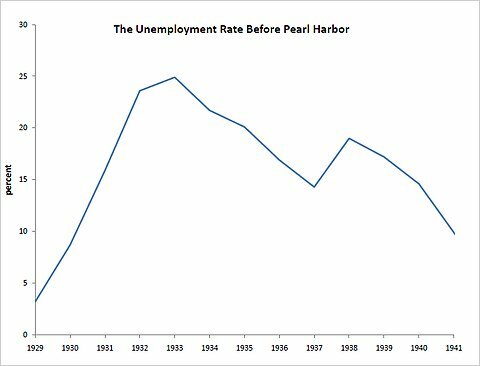 It’s true that World War II had an effect on top of the recovery the United States had experienced before Pearl Harbor, but that effect is easily exaggerated. The expanded wartime capacity did not primarily come from putting the Depression unemployed back to work but by drawing into the marketplace women, teenagers and others who were not part of the Depression labor force. Nor did wartime military spending expand the private sector. Many parts of the private sector shrank during the war precisely because the government was spending so much. We are at war in Iraq and Afghanistan today, and who knows what might be next? It is incorrect, and deeply unfortunate, for stimulus advocates to suggest that today’s war spending of almost $200 billion a year is doing its part to prop up our nation’s private economy. If the Iraq or Afghanistan wars ended and, say, 500,000 troops were discharged from duty, our private sector would not contract, as stimulus advocates contend. Rather, the private sector would expand to absorb the new veterans, in much the same way that the private sector expands every summer — even in a recession — to absorb more than a million teenagers who are “discharged” from school at the end of the academic year. A shrinking government, not a growing one, helps the private sector expand. Scenario is still the same, data updated through August 2010. I explained last week why the United States Treasury would be spending billions of dollars on the Iraq war even after it ended. Today I attempt to quantify those costs, with the help of a recent study by Prof. Ryan Edwards at Queens College. The Congressional Budget Office has estimated that the Treasury spent about $700 billion on military operations in Iraq, and an additional $400 billion on Afghanistan, between 2003 and 2010. That total includes some — but, as noted last week, not all — of the human costs imposed on our troops because, among other things, much of the salary and benefits for our all-volunteer military has yet to be paid. Professor Edwards has studied current and historical military conflicts and quantified Treasury expenditures on veterans’ benefits compared with direct expenditures during the war years. The chart below shows some of his findings for the seven major wars since the American Civil War. The vertical axis in the chart measures the fraction of (at present value) Treasury expenditures on each war that provided for veterans’ benefits rather than direct expenditures. The horizontal axis measures the duration of the war, in days. For example, the first Gulf war lasted less than 100 days, and 80 percent of Treasury expenditures on that war are expected to be in the form of veterans’ benefits (many of those veterans still have a long time to live) rather than direct costs. For the purposes of making the chart, I assumed that the Iraq and Afghanistan wars would last until June 1, 2011. To the extent that they last longer, that point should be moved to the right in the chart. 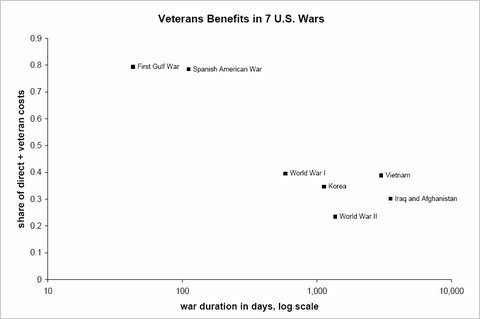 The chart suggests a negative relationship between duration of the war and the share of costs that are on veterans’ benefits. That does not mean that expected benefits fall as the war gets longer, just that expected benefits rise less with duration than the direct costs do. The Afghanistan conflict is already our longest war and is continuing. So its costs will continue to rise, and veterans’ benefits are expected to be significant. But perhaps Iraq and Afghanistan will be on the low end in terms of the share of Treasury spending that goes to veterans’ benefits. The Iraq war was more expensive than the expenses so far tabulated by the Congressional Budget Office. Every dollar we continue to spend on those wars will be associated about another 30 cents of future benefits to veterans.